Public perception of the intrepid explorer has changed dramatically over the years. Where society once held the tenacious trailblazer in high esteem, time has shown many of these scouts to be self-serving snakes in the Garden of Eden. Shining a light into the world of one such scallywag is H.T. Darling’s Incredible Musaeum – the latest offering by Submersive Productions. Based on a concept by Lisi Stoessel, and carefully co-directed by Stoessel, Susan Stroupe and Glenn Ricci, H.T. 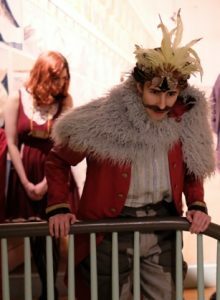 Darling’s Incredible Musaeum, “immerses the audience inside a Belle Epoque-style cabinet of curiosities populated with live actors and puppets”. The operative word here is “immerse”. You’re at one with the actors as the action unfolds, but only speak when spoken to. Admittedly, immersive theatre is not everybody’s cup of tea. So much is happening simultaneously that it’s easy to lose the thread. But if you had the good fortune to catch Submersive Productions’ Mesmeric Revelations! of Edgar Allan Poe, you’ll know what an eccentric experience is in store. Though not as hands-on as Mesmeric Revelations, you are still ushered into a unique theatre setting; in this case, the beautiful but sadly long-shuttered Peale Museum near City Hall. Once inside, the musaeum “gift shop” hints at the odd artifacts awaiting inspection on the floors above, with unusual trinkets and a display of off-the-wall wonders from the private collection of sideshow aficionado James Taylor. The bones of the story goes as follows: H.T. Darling, a high society explorer, has just returned from a space expedition through an area called “The Perisphere”. There, on a planet he’s named New Galapagos, Darling traversed both the icy outer surface and the luminous world below. In the process, he and his cohorts encountered strange creatures (or what was left of them), the remains of a long-dead race, and other items for the taking (a veritable bonanza for the souvenir shopper). Wrapped around delicate displays of the Egg of the lesser Fark, a Flightless Rang-Rang and a Partial Skull of a Giant Underland Vole, are epic yarns of conquest and courage. 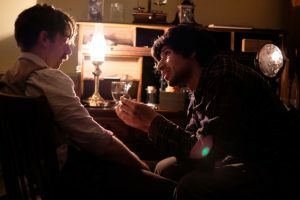 Yet, as the evening unfolds, what begins as a toast to Darling, becomes something of a psychological thriller. Darling’s foibles are evidenced early on, as he describes in graphic detail how he dispatched a herd of mammoth-like beasts on New Galapagos; then apologizes profusely for not having a specimen to display, because the creatures are now extinct. His men are no better, as one exhibit card describes how they strangled two birds into another wholly unnecessary extinction. It would all be just too hilarious, were it not for the growing feeling that the Smithsonian Institution may be housing equally ignominious artifacts. The strange stories (and stranger sub-plots) unfold quixotically for the rest of the play, as audience members – en masse or alone – are ushered about three floors of the masueam. Each segment builds upon the last, and we begin to glean what really happened on the fateful expedition. The twists are brain teasers, for sure, but as Darling well notes, “this is a demonstration on traveling at the speed of thought”. Before talking about the talented cast, please allow a nod to the artistic/creative team. Museums spend years acquiring the sort of artifacts Submersive Productions assembled for this show. It’s one thing to stage a show in a real museum – quite another to flesh out an empty one. Though the program lists everyone in the cast, their respective characters are unnamed. Knowing just a few “who’s who”, we can tell you that Sarah Olmsted Thomas perfectly portrays H.T. Darling. Thomas brings a delightful dose of mischievousness to a part which could easily (and wrongly) be played over-the-top. Her mustachioed smile keeps you guessing, even as Darling’s narrative falls apart. Alex Vernon has plenty to say as Darling’s professorial sidekick, Dr. Perry Warren. And he says much of it ala Robert Benchley. Vernon also rolls with the punches in some difficult scenes with Darling. His final scene (with Francisco Benavides) is also well-played. David Brasington and Lisi Stoessel appear as the masaeum curators. Somewhat subdued at first, the pair comes alive with motion, mime, and uproarious gymnastics. Just how into their roles are Stoessel and Brasington? In one emotional scene, they appear almost moved to tears, as the marionettes they control slowly expire. First – this is a two-hour show with no real intermission. Most of it is experienced while standing and watching, so do wear comfortable shoes. And grab a break when you can, by sitting on one of the chairs scattered about the masaeum. Trust me – your back will thank you later. Second – the Peale is not a handicapped-accessible facility. There are two flights of stairs to deal with, along with movement between several rooms on all three floors. Third – there were children in attendance the night we saw the show. If you’re wondering if Darling’s Masaeum is really a family affair, don’t let the cerebral parts of the esoteric storyline give you pause. The kids loved the artifacts, puppetry, comic interludes, and they especially loved the fossil representations. H.T. Darling’s Incredible Musaeum may not assuage your concerns over charlatans in scientific circles. But as performance art, the show is a jaunty journey through the crevices of a curious world. H.T. Darling’s Incredible Musaeum runs now – April 30 at the historic Peale Center in downtown Baltimore. Running time is about two hours with no intermission. Tickets range from $10-75. The show is appropriate for well-behaved children and adults, ages eight and above. Daguerreotypes and other recording devices are strictly prohibited. 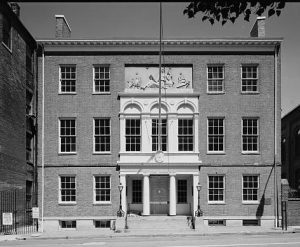 The Peale Center is located at 225 Holiday Street. Please note that the Empire-era facility is not handicapped accessible. On street parking is available and at local garages a block or two away. For tickets and more information, please visit Submersive Productions.